The Days of Johann, an agility dog! : This Memorial Day we honor the dogs of war! This Memorial Day we honor the dogs of war! 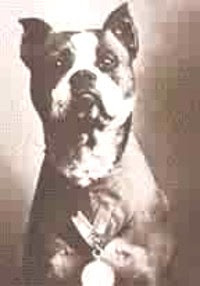 This is USMC Sargeant Stubby, hero and veteran of WWI, and perhaps the most decorated War Dog in history. In 1916, the United States was deep in a conflict that changed the world. A time of innocence and idealism would collapse in the face of WWI. As areas of sporting events, education and otherwise peaceful intentions were pressed into service by the military, a group of students participated in military training in Yale Field and were joined by a charming, happy Bull Terrier, one we would quickly identify as a Pit Bull today. Stubby, as he came to be known for his chunky body and good sense of humor, was an endearing mascot and treasured companion, so when the young men were reassigned to Newport News for final training before deployment, they couldn't abandon him. It is difficult to say how many soldiers returned home due to Stubby's alerts over gas attacks (he could smell the gas in time for the soldiers to get their masks on) or when he identified and captured (by the seat of his pants, no less) a German spy. In 1926, after a life worthy of several movies, Stubby died. His remains were preserved and are still maintained (along with his "uniform" made by the French ladies and his medals) by the Smithsonian Institution of Washington, DC. And this is Chips, the most decorated war dog from World War II. 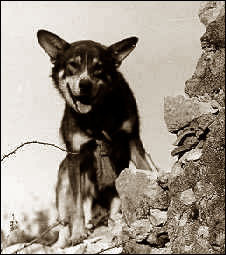 Chips, a German Shepherd, Collie, Husky mix was donated by Edward J. Wren of Pleasantville, New York, was trained at Front Royal, Virginia in 1942, and was among the dogs to be shipped overseas. He was assigned to the 3d Infantry Division and served with that unit in North Africa, Sicily, Italy, France and Germany. His assignments included sentry duty at the Roosevelt-Churchill conference in Casablanca in January 1943. Although trained as a sentry dog, Chips was reported on one occasion by members of Company I, 30th Infantry Regiment, to have broken away from his handler and attacked a pillbox containing an enemy machine gun crew in Sicily. He seized one man and forced the entire crew to surrender. He was also credited by the units to which he was assigned as having been directly responsible for capture of numerous enemy by alerting to their presence. In recognition of his service Chips was awarded the Silver Star and the Purple Heart, both were sadly later revoked, because of the impression it may give to soldiers. In 1993 Disney produced a TV movie about Chips called "Chips the War Dog". These are just two of the thousands of dogs that have given their lives to military service over the years. This Memorial Day, we honor our brave brothers and sisters who valiantly served their countries. Read and learn more about the wonderful work and lives of military dogs throughout history, through my Squidoo Lens - The Dogs of War. 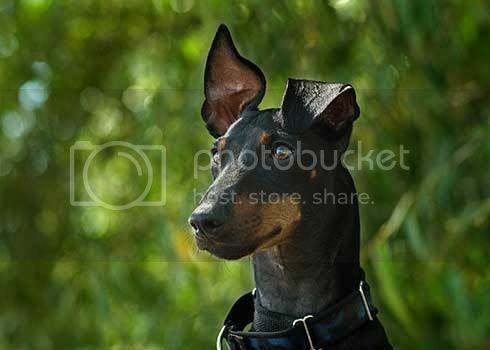 And watch this interesting video with rare footage and pictures of War Dogs throughout history. Thanks for the PAWESOME post!!! salute 2 all war dogs..